Objects are automatically generated from 3D CAD data. Thin layers are applied repeatedly to a building platform in a build-up process. These layers are then bonded together with fluid binder according to the layer geometry. This process is also known as Rapid Prototyping/Rapid Manufacturing. 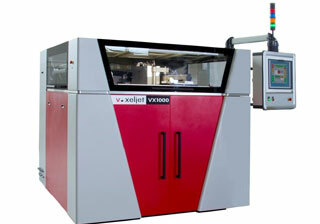 The VX500 models are proven 3D printing systems suited for a large number of application scenarios. Applications : These machines can be found wherever there is a demand for the straightforward production of prototypes and functional models. Despite their compact dimensions, they captivate with the features of a high-performance industrial printers, such as multi-jet print heads, integrated material handling and exchangeable containers. 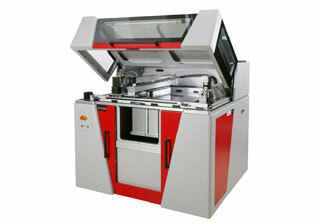 Applications : The main application or the use of the machines is for research and development purpose. Added advantage of the layered manufacturing process aids in rapid product manufacturing which helps in reducing the lead time. There are larger 3D PMMA /sand printing systems available for the Indian market like VXC 800, and VX2000 which are continuous 3D printers.